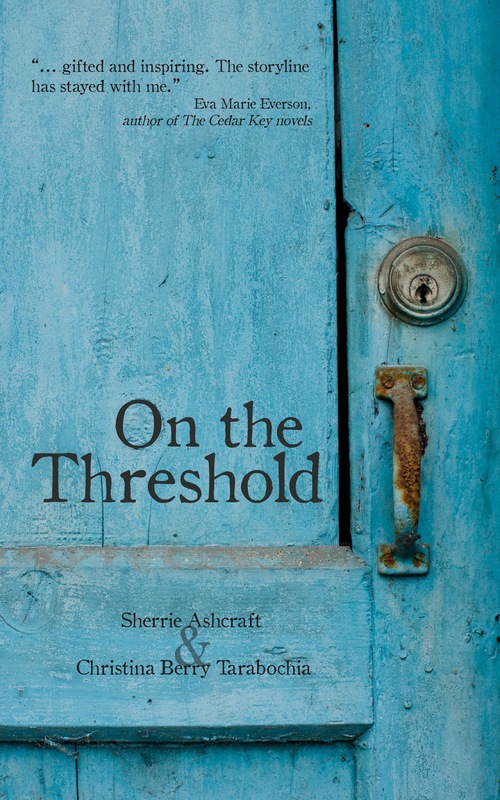 After fourteen years of hard work, Sherrie Ashcraft and Christina Berry Tarabochia are thrilled to announce the release of their novel, On the Threshold. 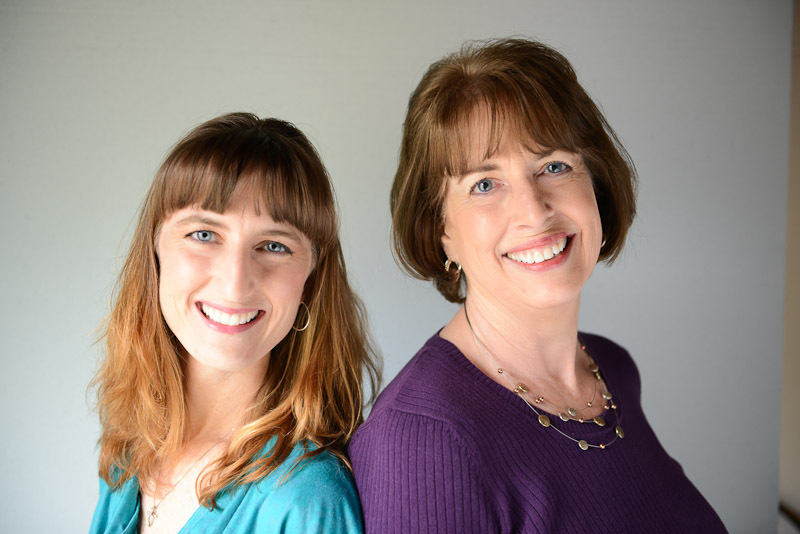 Interested in how a mother and daughter can write a book together? Want a chance at winning a Kindle and a business card design from a top-notch company? Keep reading! Why did you ladies begin writing this book? Both of us had always talked about writing a book, but fourteen years ago Sherrie said if we were ever going to write, maybe we should work on a book together. It would hold us accountable. We lived on different sides of the state of Oregon at the time, so we did a lot of it via e-mail, and once a month Sherrie would make the 250-mile drive to Christina’s house and we’d work on it in person. We wanted to share a real look at depression and trying to be good enough to please God–what that might look like in a family’s life. That’s from the first word penned. The very first contest we entered, we actually talked about how we needed to decide how to fight off all the editors who’d be making offers. Instead, we found out we had a lot to learn! Attending writing conferences and reading craft books brought our writing to a higher level. Tell us about On the Threshold. We loved having the chance to tell this story! In fact, we have a few more stories to tell about these characters if readers love this one. Here’s what the book is about. Suzanne—a mother with a long-held secret. Tony—a police officer with something to prove. Beth—a daughter with a storybook future. When all they love is lost, what’s worth living for? Suzanne Corbin and her daughter, Beth Harris, live a seemingly easy life. Suzanne has distanced herself from her past, replacing pain with fulfillment as a wife and mother, while Beth savors her husband’s love and anticipates the birth of their child. But all that is about to change. Like a sandcastle buffeted by ocean waves, Suzanne’s façade crumbles when her perfect life is swept away. Tragedy strikes and police officer Tony Barnett intersects with the lives of both women as he tries to discover the truth. Left adrift and drowning in guilt long ignored, Suzanne spirals downward into paralyzing depression. Beth, dealing with her own grief, must face the challenge of forgiveness. Can these two women learn to trust each other again? Will they find the power of God’s grace in their lives? And a little about you? If you help get the word out, you can earn different points for each thing you do, and every point represents an entry in the contest. Say, for example, you name your next child “Threshold” in honor of our book. You would earn 100 points (entries), which would greatly increase your likelihood of winning. Fine print to be read as quickly as those medical side effects are glossed over on TV: A certified copy of the birth certificate must be sent to Ashberry Lane proving the child was born between now and when the contest ends on June 30rd at 10 PM, PDT. Some restrictions apply, such as you must also promise not to change the child’s name to anything else for at least the next fifteen years. You are, however, allowed to use “Thresh” as his or her first name, and “Hold” as the middle. If that seems like we’re asking a little too much, there are other ways for you to enter the contest. ~ Post about On the Threshold on Twitter or LinkedIn, or share the cover on Instagram or Pinterest, and you’ve doubled your points to TWO. ~ Refer someone to sign up for the newsletter. If he or she notes you as referrer, guess what? You just earned THREE points. ~ And for those who buy the book (e-book or print copy), you will gain FIVE points. ~ Leave a review—positive or negative—on a retailing site after reading the book, and TEN points to you! All you have to do to enter is drop us an email to Christina [at] ashberrylane [dot] net with a description of what you did. We trust you. Fortunately, my last name is Hold, so when my triplets were born yesterday, all I had to do was name them “On,” “The,” and “Thresh.” (Yes, that makes a double “h,” but without it, the name just looks silly and I don’t want a kid with a funny name.) I also got the cover of On the Threshold tattooed on my arm, took a picture of it, and posted it on every possible social media site, including Facebook, though I understand I don’t get points for anything done on there. Next, I forwarded the Infrequent, Humorous Newsletter to a few of my friends and ALL of my enemies. After reading the book in two hours, I posted an honest review on three different retail sites. Please enter my name 349 times. Where else can we find you gals online? The theme of God’s forgiveness and His love for all of us is a constant thread in “On the Threshold.” His grace and mercy are woven throughout and His message of salvation is shared in a gentle manner. “On the Threshold” needs to be at the top of your summer reading list!